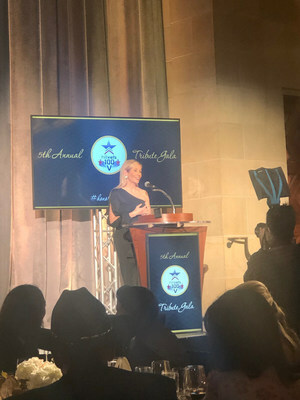 WASHINGTON, March 28, 2019 /PRNewswire/ -- HillVets, an organization that helps veterans launch careers in governance, international affairs, policy, and politics, honored the Wounded Warrior Project® (WWP) senior vice president of government and community relations, René Bardorf, during its annual HillVets 100 Gala. Bardorf received recognition for her many contributions to the veterans service organization and advocacy on veterans' issues. The HillVets 100 Gala recognizes and highlights the most influential and impactful veterans, servicemembers, innovators, and supporters from the previous year, across all eras and branches of service. Selectees represent a broad spectrum of veterans and public servants from artists to elected officials to business executives, among others. "HillVets is proud to include René in this year's HillVets 100 of 2018," said Justin Brown, founder of HillVets. "She has been a positive force in the veteran space for 25 years and works daily to improve the lives of our wounded warriors, and we are proud to work alongside of her." "It's an honor to be recognized alongside such accomplished men and women who passionately advocate for America's veterans," said Bardorf. "Each recipient has dedicated themselves to ensuring that service members, veterans, and their families are supported and honored. America has been at war for nearly 25 years and the needs of our nation's veterans continue to grow, strategic collaboration and partnerships among best-in-practice military organizations ensure critical gaps in care are managed effectively, in communities that need it most." WWP partners with HillVets on its Leadership, Ethics, Advocacy, and Dedication to Self-Improvement (LEAD) program to help young veterans rise to roles of influence and leadership in our nation. Since 2012, WWP has partnered with 158 military support and veterans service organizations. To learn more about how these partnerships are transforming the way America's injured veterans and military families are empowered, employed, and engaged in our communities, visit https://wwp.news/Newsroom.